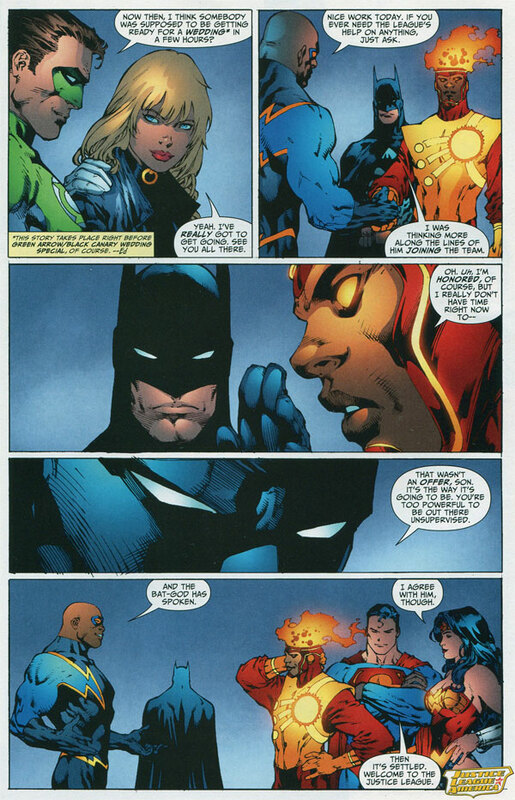 I really like the way Jason joined the JLA. See the page below from Justice League of America vol. 4 #15 (Jan. 2008) by Dwayne McDuffie and Ed Benes. I like Batman’s demanding nature in this bit. I think the scene works really well. I don’t see it as condescending to Jason, but it does point out his inexperience. Fair enough. His time on the JLA has really helped the character grow up, or at least make him more comfortable interacting with the “big time” metahumans. Posted in: Comic books, Dwayne McDuffie, Firestorm #07: Jason post-Infinite Crisis, Jason Rusch, Justice League of America.